As the third oldest club in the world, Oakland Rotary has had an impact. As the first club to organize lunch meetings and an early and vocal proponent for the inclusion of women in Rotary, Oakland has launched Rotary traditions and initiatives that continue today. In 1908, after reading the newspaper announcement of the new San Francisco Rotary Club, businessmen from east of the bay decided to meet to discuss establishing their own club. The day after Thanksgiving in 1908, Homer Wood, founder of the San Francisco Rotary, took the ferry across the bay through the pouring rain to meet for lunch with Frank Bilger of an Oakland rock quarry and paving company, and twenty-three other businessmen at the Hotel Metropole in downtown Oakland. As the men entered the Victorian dining room, they chatted about recent news and the ongoing rebuilding in San Francisco following the earthquake of 1906, as well as the housing boom in Oakland sprred by families moving across the bay. Frank called the men to order and introduced Homer, who told the men about this “booster club” in Chicago called Rotary. He explained its goals and the enthusiasm it generated among businessmen in San Francisco. 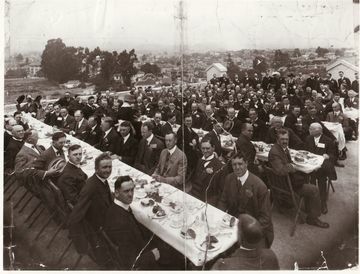 The men liked the idea, and the gathering became the first meeting of what would become the Oakland Rotary and the third club in the world. The founding spirit of service in Rotary continues today through local scholarships, hands-on volunteer events, and much more ensuring Oakland thrives for generations to come. 1911: Reclamation of the marshland around what would soon be Oakland’s main passenger train station became the club’s first civic project. 1917: 1,200 acacia trees planted to beatify and shade the southern approach to the city; 7,000 pairs of shoes sent to France for World War I victims. 1925: Funds contributed to the Necklace of Lights circling Lake Merritt, a public work designed by Oakland Rotarian, Romaine W. Meyers. 1950: Funds contributed to the opening of Children’s Fairyland and the new Humpty Dumpty Wall. 1961: Saroni-Lena scholarship program launched; it remains one of the East Bay’s largest, continually running college scholarship programs; since inception, it has provided over $1.2 million in scholarships to Oakland high school seniors. 1982: Camp Enterprise established to educate high school students about the free enterprise system and leadership skills; known today as the Enterprise Institute. 1983: Unable to officially admit women, the Oakland club opened all meetings to female guests. 1987: Following a decade of national discourse and debate, Rotary International finally allowed women as members; Oakland immediately welcomed six women as members. 1992: The Uniendo America Project Fair was established to bring together Rotarians from North America, to meet with clubs in entral America and assist with projects spearheaded by clubs there. 1993: HOPE (HELP OAKLAND PUPILS EXCEL) program launched, providing Rotarian mentors to underserved Oakland students from seventh to twelfth grade and $10,000 post-secondary scholarships to those who meet certain goals and graduate from high school. 2004: Ten year project in Roberts Regional Park completed to create a playground accessible to Oakland children of all abilities. 2008: Oakland Reads project launched, providing three books to every Oakland public school third grader. 2013: Kinderprep program launched for comprehensive support of Oakland public schools’ transitional kindergarten classes.